Now reading: GO SMILE TECH: DOES BLUE LED LIGHT REALLY WHITEN TEETH? GO SMILE TECH: DOES BLUE LED LIGHT REALLY WHITEN TEETH? The GO SMILE Dental Pro Whitening System uses low-frequency, blue LED, light-wave technology built directly into its sonic toothbrush, the Dental Pro Smart Brush. This light DOES NOT whiten teeth by itself; rather, the light ACTIVATES GO SMILE’s teeth whitening gel to boost the strength and brilliance of the whitening process. This combined technology of the GO SMILE’s whitening gel, gentle sonic oscillation and blue light from the Dental Pro Smart Brush GUARANTEES a cleaner and brighter smile with virtually no sensitively. Why is “BLUE LIGHT” so effective? What makes it so special? 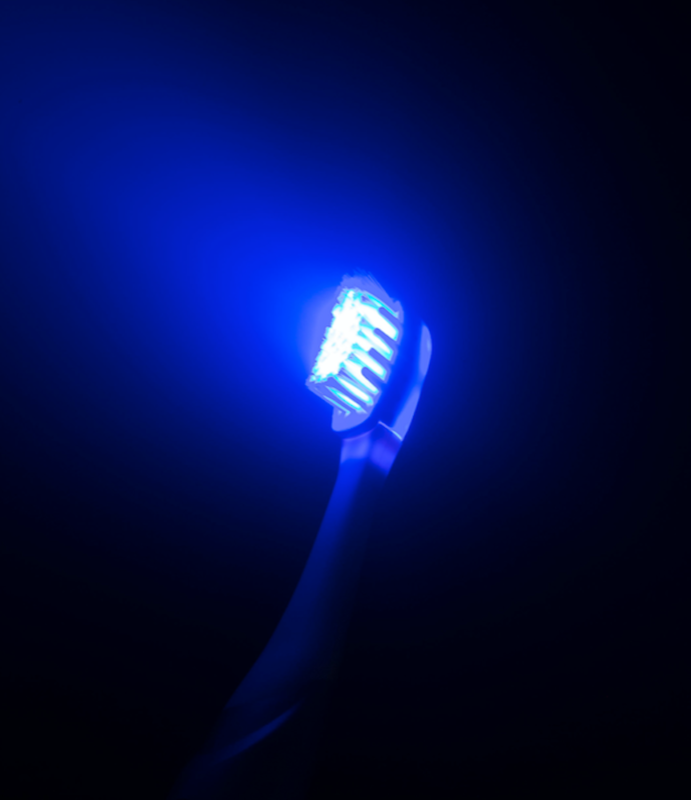 Can a little blue light really help make your teeth whiter? Light is in its simplest definition – energy – in the form of an electromagnetic wave. There are countless forms of light from the ones we can clearly see, like the kind emitted from a lamp, to harmful ultra-violet rays and invisible infrared– both harmful if there is too much exposure. However, scientists have been investigating effects of BLUE LIGHT on the human body, for decades and found incredible amounts of energy with few known side effects. So, science, medicine and many holistic practices have begun to USE blue light in a variety of ways. Studies have revealed blue wave-length light having a host of potential health benefits– including therapeutic remedies for acne, mood swings, rosacea, wrinkles and psoriasis. Additionally, blue light has been proven to kill harmful, antibiotic-resistant bacteria and is often used to disinfect cuts, scrapes and burns. Most successful applications only require about two minutes of use; which, ironically, is the recommended time that the American Dental Association recommends that you brush – two minutes, twice a day.